"You were born a total sinner!" [the Jewish leaders answered to the man who had been healed of his blindness]. "Are you trying to teach us?" And they threw him out of the synagogue. God despises the abuse of power. 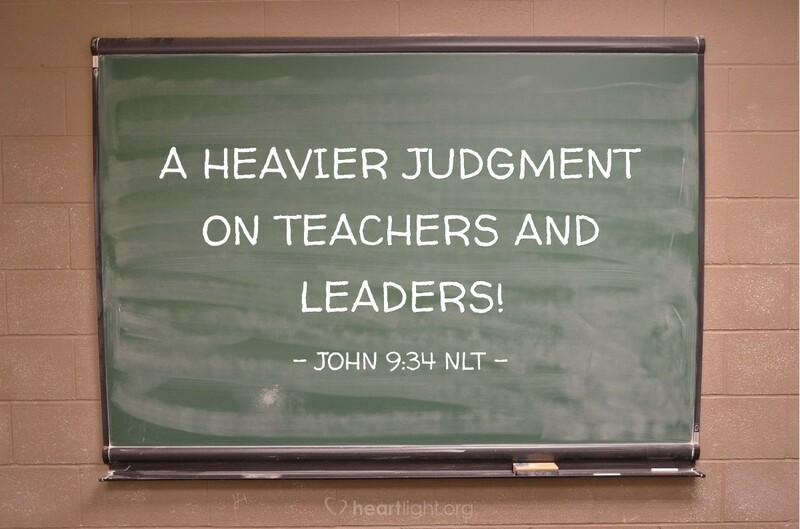 He repeatedly warned against it in Old Testament times, and he warns those who teach and lead in his Kingdom that they had better do so honorably or they will stand under harsher judgment. When these religious authorities cannot discount the truth of the healed man's statements and they cannot discredit Jesus, they resort to shaming the man and to expelling him from their society. In other words, they want to get rid of the witness and the evidence. Such behavior is damnable. If we are leaders, let's be warned of how awful such behavior is and how God abhors it. Almighty and holy Father, please give me the courage to always look for truth. Help me never be so self-deceived that I resort to such deplorable actions as these religious leaders. Give me a teachable heart that yearns for your truth. In Jesus' name. Amen.